The Connecticut Department of Public Health has a whole website devoted to employers who wish to run a flu clinic. And the CDC has lots of information like the button below. But can an employer mandate that employees get a flu shot? Around Connecticut, numerous healthcare institutions started instituting mandatory vaccinations for their workers…and the local press made it a big issue. Lost in that so-called debate, however, was the clear-cut guidance that came out from the Commission on Human Rights and Opportunities. 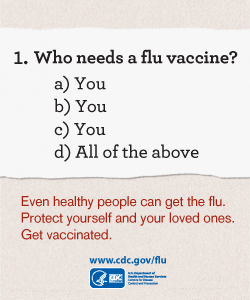 In an article last December, the CHRO said unequivocally that there was no issue with mandatory flu shots. Charles Krich, principal attorney for the Connecticut Commission on Human Rights and Opportunities, says this corporate policy [of mandatory flu shots] does not violate constitutional rights. It also does not qualify as discrimination. “About a hundred years ago, the Supreme Court said the state absolutely has the right to require vaccinations of people to protect the public health,” Krich explained. Despite the undisputed public health benefits to such a policy, State Senator Joe Markley introduced a bill earlier this year into the Connecticut General Assembly that would ban such mandated vaccinations. Thankfully, the bill went nowhere. Employers should, however, still be mindful of federal laws that mandate some accomodation of an employee’s religious beliefs and may, on a case-by-case basis, consider some flexibility. Employers with unions and collective bargaining agreements should also be mindful that some have argued that mandatory flu shots should be a bargained-for term of employer. Last year, the NLRB ruled that a hospital did not violate the federal labor laws when instituting a mandatory policy over the objections of the nurses’ union. But that decision relied on a broad “management rights” provision so employers should have their own situation reviewed by their labor counsel.